The world is no longer the place it once used to be. The rate at which man has made progress in terms of technology and industrialisation is in direct proportion with the increase that we know as pollution of the atmosphere. The world has found itself in the clutches of various types of pollution one of the most dangerous being air-pollution. Air-pollution is the introduction of chemicals matter or other materials into the atmosphere that can bring on discomfort to humans or other living organisms, and even cause damage to the environment. Chemicals, gases and other polluted substance leaked in to the air that can cause harm to humans and the environment are known as air pollutants. Pollutants can be in the form of solid particles, liquid droplets, or gases. Sometimes such substances may come from natural sources such as smoke arising from forest fires, volcanic eruptions or pollutions from other natural occurrences. Pollutants are also added to the atmosphere by human activities, the sources of air pollutants are factories, power plants, automobile exhausts including road vehicles as well as aircrafts, and even the burning of fire wood. Vehicles produced a high-level is of pollutants like carbon monoxide, carbon dioxide, nitrogen monoxide. Carbon monoxide is produced from incomplete burning of fuels such as petrol and diesel. It is a poisonous gas and reduces the oxygen carrying capacity of the blood. Many industries are also responsible for causing air pollution, petroleum refineries are a major source of gas and pollutants like sulphur dioxide and nitrogen dioxide. Sulphur dioxide is also produced by the combustion of fuels like coal in power plants. These can cause a number of respiratory problems including permanent lung damage. A common sight during winter is that of the air being covered with a fog like layer. This layer is a combination of smoke and fog and is known as smog. Smoke may contain oxides of nitrogen which combine with other air pollutants which form smoke. Smoke causes breathing difficulties such as bronchitis and asthma, due to the particular matter and fine particles that it carries. Other kinds of gases used in refrigerators air-conditioners and sprays are called Chlorofluorocarbons or CFCs that damage the ozone layer of the atmosphere. High energy ultraviolet radiation, known as UV rays in the stratosphere breaks oxygen molecules or O2 apart forming two separate nasant oxygen atoms or O. These oxygen atoms are highly reactive and quickly join with nearby oxygen molecules to form ozone or O3. The ozone layer protects us from ultraviolet violet UV radiation as it absorbs these harmful rays. The absorbed UV radiation splits the ozone molecules or O3 into a nasant oxygen atom or O and an oxygen molecule O2. The isolated nasant oxygen atom are combined with a nearby oxygen molecule O2 forming a new ozone molecule O3, the cycle continues and creates the protection from the ultraviolet radiation coming from the sun. The chlorofluorocarbons or CFCs released into the air are broken apart by the ultraviolet radiation; the chlorine atoms are then freed from the CFCs and go ahead to destroy ozone. When a chlorine atom CL collides with an ozone molecule O3 it takes a nascent oxygen atom Oand forms chlorine monoxide CLO, leaving behind ordinary oxygen O2 molecule, when an oxygen atom combines with a chlorine monoxide CLO the two nasant oxygen atoms O from an oxygen molecule O2, the chlorine atom CL2 is thus released and is free again to destroy another ozone molecule O3. The cycle continues, leading to the depletion of the ozone layer. The ozone layer has been suffering from this damage for many years now. Another adverse effects from air-pollution is acid rain. The smoke being released from factories and cars releases gases like sulphur dioxide and nitrogen oxides which react with water vapour or clouds present in the atmosphere to form sulphuric acid and nitric acid. The acids drop down with the rain making the rain acidic this is called acid rain. The rain is mainly responsible for eroding the surfaces of buildings and monuments especially those made of marble. Let's just take a look at the biggest and most dangerous effects of air pollution, if you can imagine a greenhouse in the garden of a house you will recall the sun's heat is allowed to get in but is now not allowed to go out. The solar radiation comes in through the glass very easily, heating up the ground the heated ground in return gives out infrared radiation which cannot escape through the glass. The trapped heat warms the greenhouse; this is the perfect example of the greenhouse effect which happens to the earth's atmosphere. The Sun’s rays heats up the earth surface, where the Earth surface radiates the infrared radiation some of the gases in the atmosphere like carbon dioxide CO2 and nitrogen oxide and water vapour H2O ensure that this radiation does not leave the atmosphere. Because of a number of human activities including the use of combustion engine vehicles producing vehicle carbon emissions, the amount of carbon dioxide in the atmosphere is increasing rapidly. Because of this more and more radiation is getting trapped in the atmosphere and increasing the atmospheric temperature. 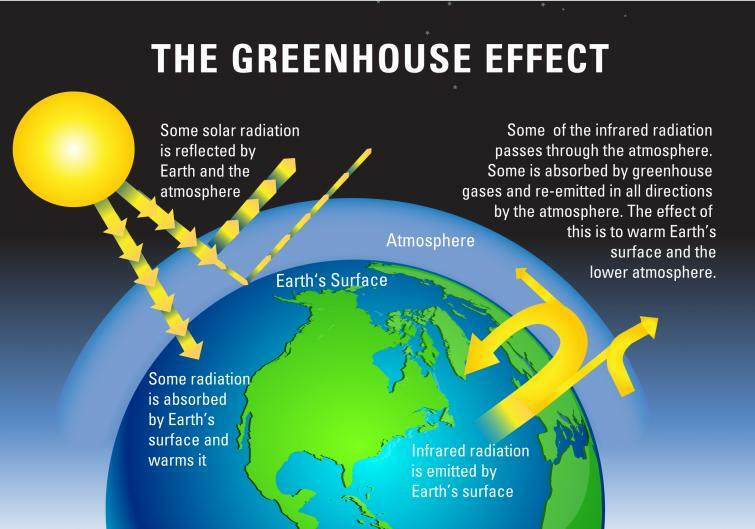 The greenhouse effect causes the earth's temperature to increase which has resulted in the biggest natural threat ever better known as global warming. We at ecocars4sale.com promote greener low emission vehicles, find out more about green cars here.